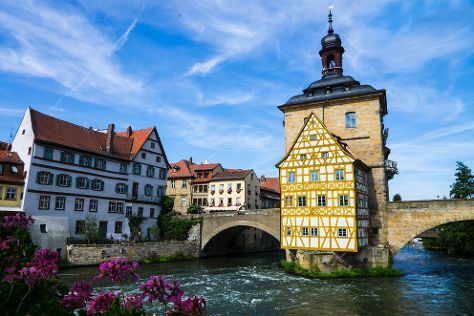 First mentioned in historical records from the year 902, Bamberg retains today the medieval, old-world charm that has defined its past development. Start off your visit on the 18th (Fri): contemplate the long history of Neue Residenz, contemplate in the serene atmosphere at Bamberger Dom, steep yourself in history at Bamberg Altstadt, examine the collection at Alte Hofhaltung, then pause for some serene contemplation at Kirche St. Maria und St. Theodor, and finally steep yourself in history at Altes Rathaus. Get ready for a full day of sightseeing on the 19th (Sat): identify plant and animal life at Wildpark Schloss Tambach, then explore the historical opulence of Schloss Ehrenburg, then explore the historical opulence of Veste Coburg, and finally take in the spiritual surroundings of The Basilica of the Vierzehnheiligen. For more things to do, traveler tips, reviews, and more tourist information, read our Bamberg trip planning tool . Sao Paulo, Brazil to Bamberg is an approximately 18.5-hour combination of flight and train. You can also do a combination of bus, flight, and train. Due to the time zone difference, you'll lose 4 hours traveling from Sao Paulo to Bamberg. Expect colder temperatures when traveling from Sao Paulo in October; daily highs in Bamberg reach 17°C and lows reach 6°C. Finish up your sightseeing early on the 19th (Sat) so you can catch the train to Munich. 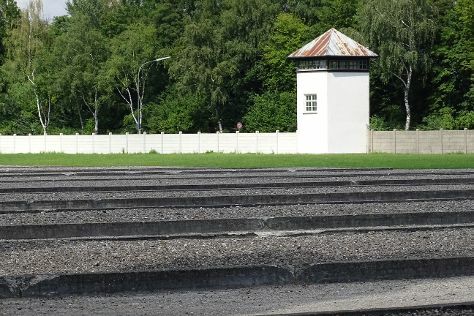 Start off your visit on the 20th (Sun): steep yourself in history at Dachau Concentration Camp Memorial Site, admire the natural beauty at Schloss Nymphenburg, and then take in the spiritual surroundings of St. Michael's Church. Get ready for a full day of sightseeing on the next day: walk around English Garden, then examine the collection at Munich Residenz, then contemplate in the serene atmosphere at St. Peter's Church, and finally don't miss a visit to Marienplatz. To find photos, maps, other places to visit, and more tourist information, read our Munich trip planner . Traveling by train from Bamberg to Munich takes 2 hours. Alternatively, you can drive; or take a bus. October in Munich sees daily highs of 16°C and lows of 5°C at night. 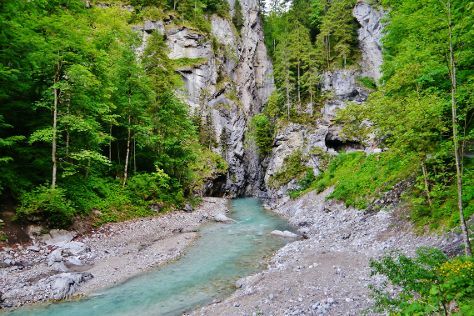 Finish your sightseeing early on the 21st (Mon) so you can drive to Garmisch-Partenkirchen. On the 22nd (Tue), hit the slopes at Zugspitze and then identify plant and animal life at Partnachklamm. Here are some ideas for day two: contemplate in the serene atmosphere at Oberammergau Church, take in the architecture and atmosphere at Wies Church, then contemplate the long history of Altstadt von Fuessen, and finally step into the grandiose world of Linderhof Palace. To find photos, maps, traveler tips, and other tourist information, go to the Garmisch-Partenkirchen trip planner . Getting from Munich to Garmisch-Partenkirchen by car takes about 1.5 hours. Other options: take a bus; or take a train. In October, daytime highs in Garmisch-Partenkirchen are 19°C, while nighttime lows are 6°C. Finish your sightseeing early on the 23rd (Wed) so you can drive to Rothenburg. Kick off your visit on the 24th (Thu): get a sense of history and politics at Stadt Rothenburg ob der Tauber, step into the grandiose world of Würzburg Residence, snap pictures at Alte Mainbruecke, then take an in-depth tour of Marienburg Fortress, then wander the streets of Old Town, and finally see the interesting displays at Medieval Crime Museum (Mittelalterliches Kriminalmuseum). Keep things going the next day: don't miss a visit to Schloss Weikersheim, take in the spiritual surroundings of Herrgottskirche, then steep yourself in history at Town Walls, then steep yourself in history at Rothenburger Tor, and finally get to know the fascinating history of Old Town. To see ratings, maps, and more tourist information, go to the Rothenburg visit planning app . You can drive from Garmisch-Partenkirchen to Rothenburg in 3 hours. Alternatively, you can take a train; or do a combination of train and flight. When traveling from Garmisch-Partenkirchen in October, plan for a bit cooler days and about the same nights in Rothenburg: temperatures range from 15°C by day to 7°C at night. 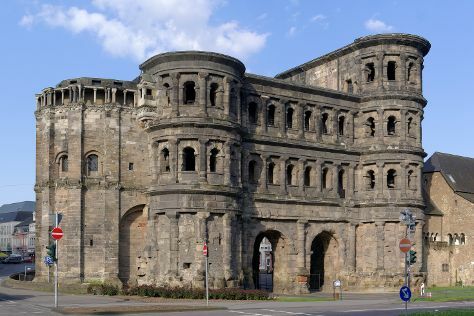 Cap off your sightseeing on the 25th (Fri) early enough to go by car to Trier. Kick off your visit on the 26th (Sat): admire the striking features of St. Peter's Cathedral (Dom), take in the spiritual surroundings of Liebfrauenkirche, then examine the collection at Rhineland Museum (Rheinisches Landesmuseum), then delve into the distant past at Porta Nigra, and finally steep yourself in history at Romische Villa Urbana. For reviews, where to stay, other places to visit, and more tourist information, you can read our Trier trip itinerary app . Traveling by car from Rothenburg to Trier takes 3.5 hours. Alternatively, you can do a combination of train, flight, and bus; or do a combination of train and shuttle. In October, daily temperatures in Trier can reach 15°C, while at night they dip to 7°C. Wrap up your sightseeing on the 26th (Sat) early enough to drive to Ostseebad Binz. Kick off your visit on the 27th (Sun): take in the architecture and atmosphere at Die Kirche St. Maria Magdalena, take in the spiritual surroundings of Katholische Kirche Stella Maris, then look for all kinds of wild species at Insel Vilm, and finally look for all kinds of wild species at Naturerbe Zentrum Ruegen. For maps, other places to visit, more things to do, and tourist information, you can read our Ostseebad Binz road trip tool . Traveling by car from Trier to Ostseebad Binz takes 8.5 hours. Alternatively, you can do a combination of bus, flight, and train; or take a train. In October, plan for daily highs up to 15°C, and evening lows to 10°C. Finish up your sightseeing early on the 27th (Sun) so you can go by car to Berlin. 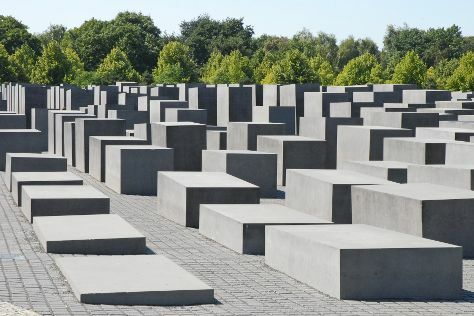 Pergamonmuseum and Memorial and Museum Sachsenhausen are good opportunities to explore the local culture. Deepen your sense of the past at sights like East Side Gallery and Mauermuseum - Museum Haus am Checkpoint Charlie. The adventure continues: get a sense of history and politics at Reichstag Building, make a trip to Brandenburg Gate, steep yourself in history at Memorial of the Berlin Wall, and step into the grandiose world of Charlottenburg Palace. To find reviews, maps, and more tourist information, go to the Berlin trip itinerary maker app . Traveling by car from Ostseebad Binz to Berlin takes 3 hours. Alternatively, you can take a train; or take a bus. Finish your sightseeing early on the 30th (Wed) so you can travel back home.